POAS VOLCANO and LA PAZ WATER FALLS GARDEN, COSTA RICA: Costa Rica is unimaginably incomplete if you don’t get out of its metropolitan life and visit its engaging natural beauty. Visitors have to uncork its beauty by visiting its dramatic volcanoes, youthful rainforest, powerful waterfalls, and taking revitalized hikes. This day-trip by far was one of the most interactive and fun journeys for our girls as well as for us. And if you are a nature photographer…then this is a double-must-see, you won’t regret it. 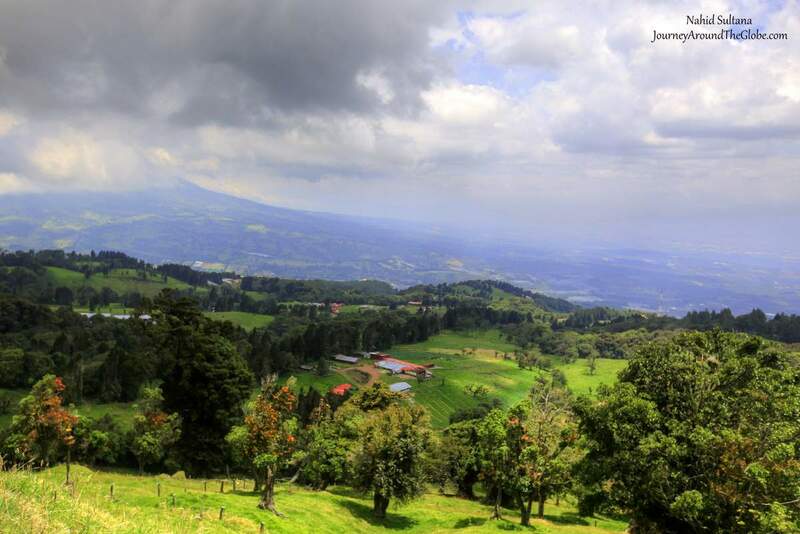 As a country Costa Rica was rated as the happiest country in the world. It enjoyed being the first democratic country in Latin America and is the “Silicon Valley” of Latin America. We heard lots of stats like these from our guide in this tour. But even before these, I fell in love with Costa Rica as we were prepping for our Central America tour. Seeing and experience the nature so closely gave us the opportunity to see how beautiful this country really is. TIME of TRAVEL: We were in Central America in the mid-March of 2015. The first two countries that we visited here were El Salvador and Panama. Three days in Costa Rica flew by really quickly before our last destination to Nicaragua. The weather can get hot and muggy at this time of the year. Make sure to bring sunscreen and comfortable shoes for this trip…you will be walking a lot. OUR HOTEL: Our hotel Radisson was located about 15 minutes’ walk from the downtown San Jose. It had a beautiful swimming pool and hot tub, free traditional and continental breakfast buffet, and free Wi-Fi. It was nice to have typical Costa Rican dishes every morning, which were black beans with rice, some local cheese and coffee. 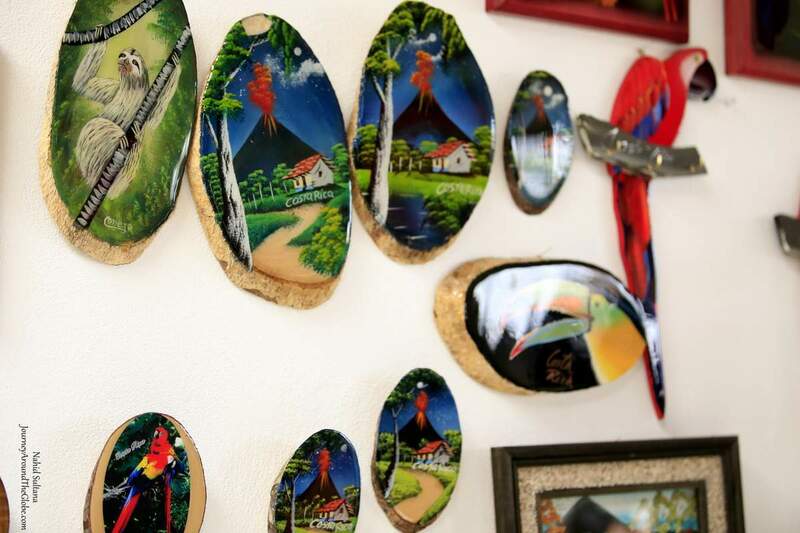 EATING and SHOPPING: The trip included traditional style Costa Rican breakfast and lunch. After our first stop at Alajuela, we sat down in Doko State Coffee Plantation for a late breakfast. Some rice with black beans, fried plantain, egg, tortilla, and cheese for breakfast…can’t beat that. And lunch was in the café at La Paz Waterfalls Garden. Other than that we got some nice treatment from the tour guide company. The guide stopped at few different shops, picked up local munchies for all of us and made us try all of them. Guava empanadas were one of my favorites, including local sweet strawberries. Costa Rica is known to be one of the best producing coffee beans in the world and the coffee here is 100% natural and organic. We stopped at few different souvenir shops along the way and at the below destinations. Other than coffee, you can get traditional coffee making pots, chocolates, wood curved wall decors, and local jewelries in these stores. PLACES WE’VE VISITED: This was a guided tour in the following areas. My most favorite thing to see in whole Costa Rica or in this whole Central America trip was visiting La Paz Waterfalls Garden. Poas Volcano was absolutely a breathtaking place to see too and hiking was the best in this park. 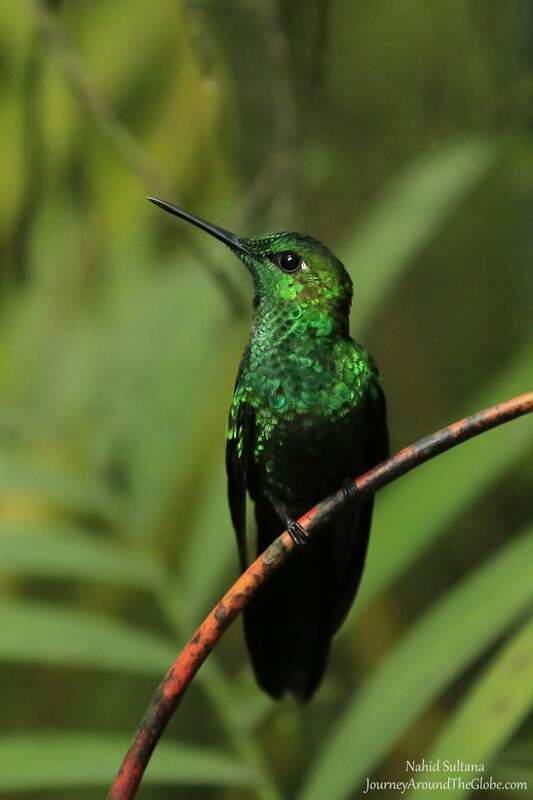 This is a must-take tour in Costa Rica. 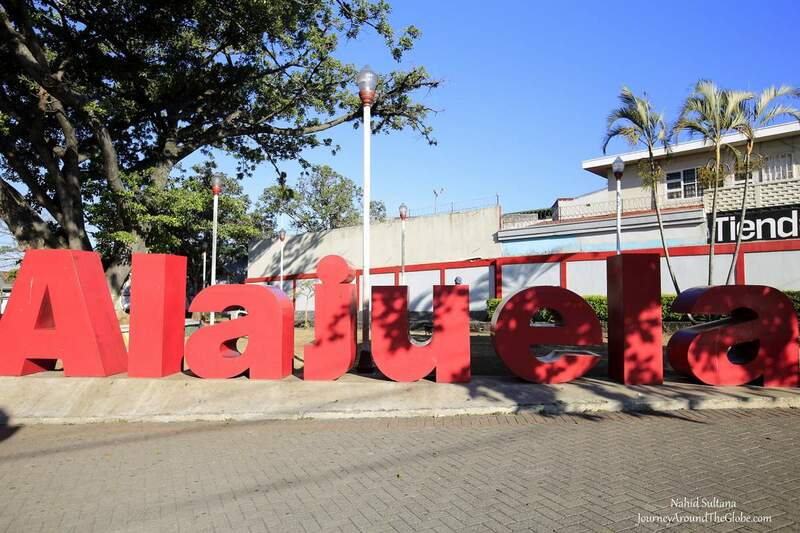 1) ALAJUELA: 20km from San Jose is the historic city of Alajuela. We stopped in the heart of city center after picking all of our group members. The statue of National Hero “Juan Santa Maria” stands in the big round plaza, who sacrificed his life during the battle with Nicaragua in 1856. Teatra Municipal is a yellow building that stands on one side of the plaza…an art-deco, neo-classic style architecture. Beside that is the Catedral Alajuela. And finally the white building in this plaza is the last military headquarter of Costa Rica (now Costa Rica is a military-free country)…presently a museum. 2) DOKO STATE COFFEE PLANTATION: From Alajuela, it was a harmonious drive to Doko State Coffee Plantation. This is a 112 year old coffee plantation place where you can learn everything about coffee. This coffee tour taught us a lot about this bean, like how it’s grown and processed. We saw some different demonstrations and phases of processing coffee in Doko State Coffee Plantation. 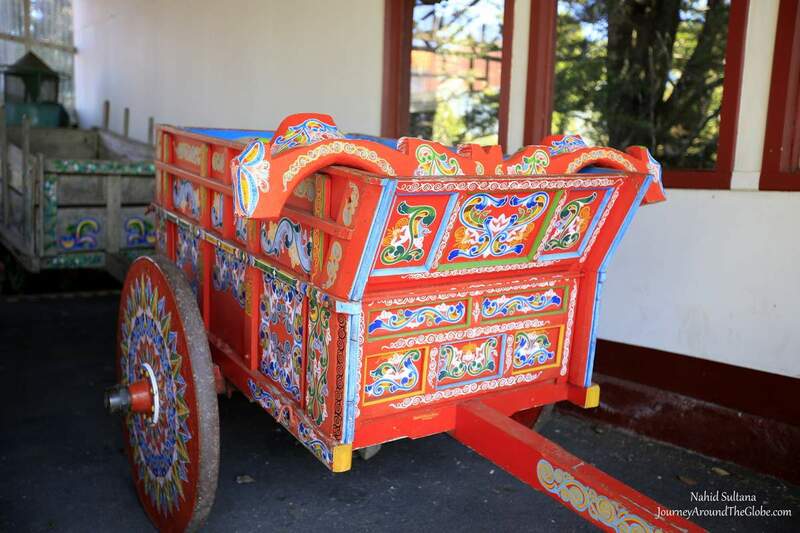 You can see traditional ox-cart during this tour which is an icon of this country. Vargas family owned this 6000 hectors of plantation where visitors can now see a small coffee museum, old machineries, and a souvenir shop. Originally, the first coffee came to Costa Rica from Ethiopia. The golden age for coffee in this country is 1832-1856. 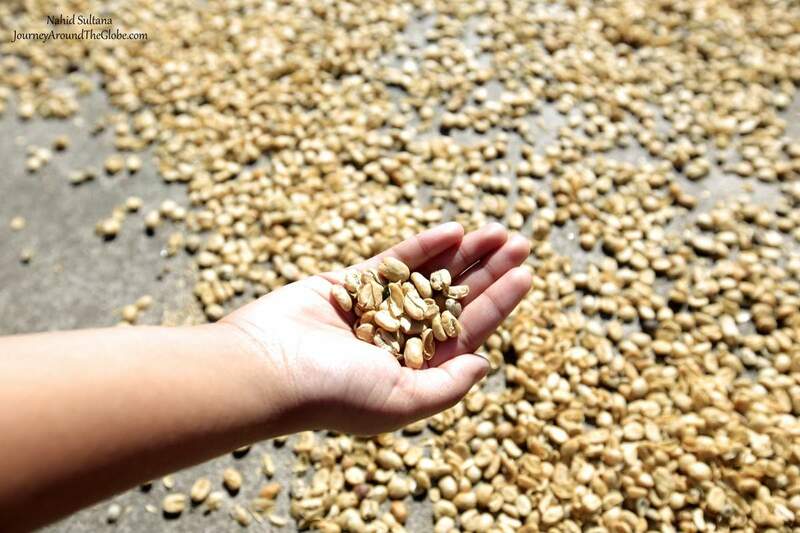 Now big companies, like Nescafe or Starbucks, get their 100% coffee beans from here. The plantation is open from Monday thru Friday from 9am to 3:30pm. 3) POAS VOLCANO NATIONAL PARK: About 75km from San Jose, this is a must-see adventure of Costa Rica. Unlike Irazu Volcano, this park was more beautiful, scenic, and gave me a feel of being in a rainforest jungle. The park opened in 1971. This protected wildlife area ranges from 4000 ft. to 8,860 ft. above sea level and covers 16,000 acres of grounds with hundreds of different species of flora and fauna. With more than 80 species of mammals and birds, this park has a rich diversity of wildlife. 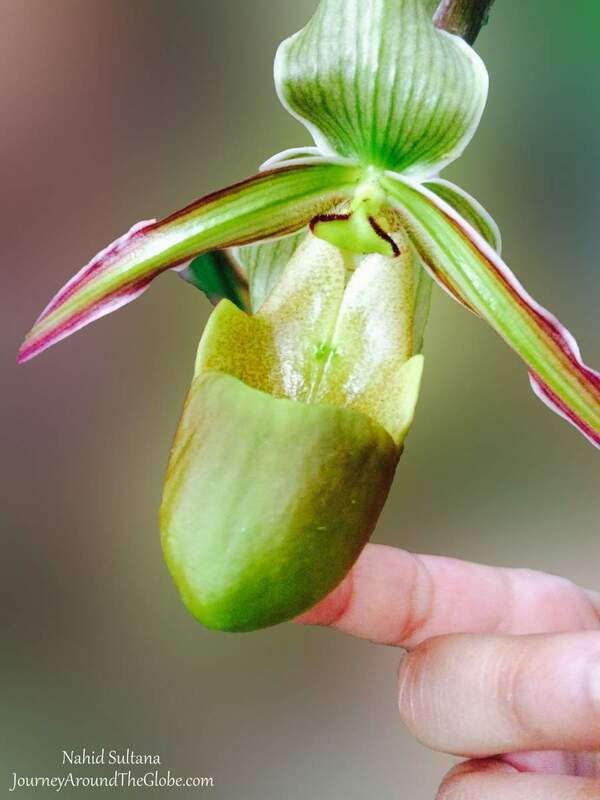 Common flora species include Poor man’s umbrella, ferns, bromeliads, and other exotic plants. Visitors not only get up-close and personal with the luring rainforest, but also can enjoy impressive views from different sites along the trails. Poas Volcano is an active volcano which erupted nearly 40 times since 1828. It is an active composite volcano with a conical shape and various caldera depressions. From the parking lot we took the Poor Man’s Umbrella trail, about 15 – 20 minutes’ of walk, to come to the Main Crater. 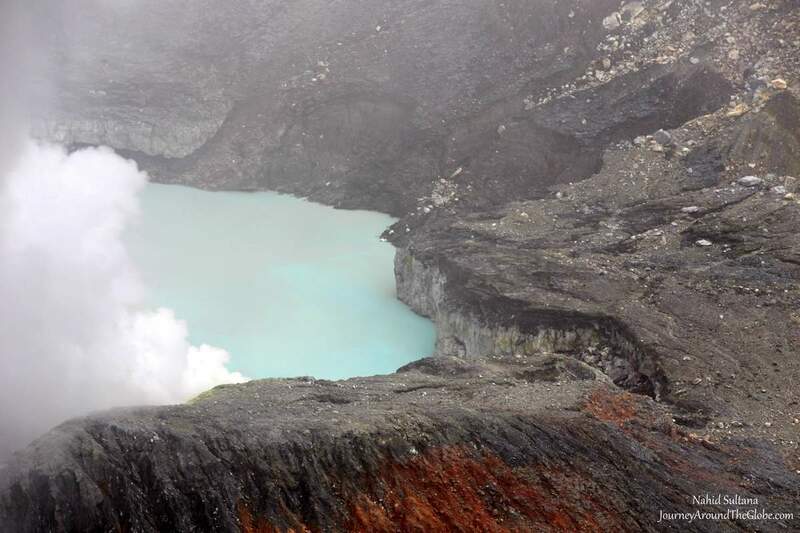 The Main Crater of Poas Volcanos is a mile wide circular depression which is 300 meters deep and 1320 meters in diameter with a crystal blue lagoon rich in sulfur and acids. This is one of the world’s most acidic lakes and therefore, supports little or no aquatic life. (Caution: you can smell/inhale Sulphur from the terrace, you may feel irritation in your yes or lungs standing there for a long time). Standing on the terrace, you can see the main dome, ash layers, old crater, and also Caribbean Coast on a nice day. When we were there, the cloud/fog hid the crater for the most part. If you are lucky, you can see the whole crater with its sulfuric/acidic colors. We couldn’t see the Main Crater properly because of the cloud but still enjoyed its unique features. 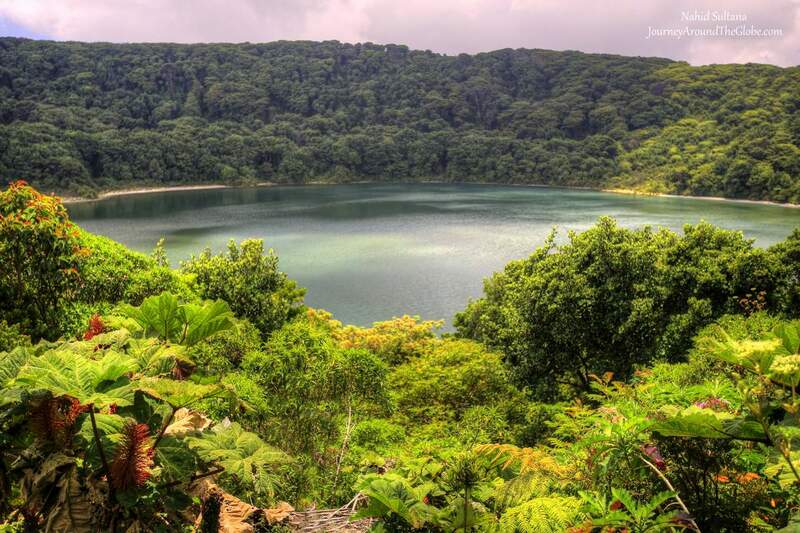 From the Main Crater we followed Botos Lagoon Trail that took us to Lake Botos…an inactive crater filled with clear water and surrounded by cloud forest. This was a beautiful place I must say. Escalonia Trail is a long trail which eventually brought us to the starting point near the parking lot. We saw hundreds of different kinds of exotic species including ferns, Poor Man’s Umbrellas, bromeliads along the way…oh yeah, and a squirrel. Basically, it was about half a mile to the first crater, two miles to go the lagoon, and total of three miles to come to the parking lot again. The park is very well equipped with tour guide services, facilities for disabled guests, shops, and restaurants. It took us about little more than just two hours to hike, walk, and explore this place. It’s open from 8am to 3:30pm everyday. 4) LA PAZ WATERFALLS GARDEN: Our last and most exciting destination of this trip was La Paz Waterfalls Garden. The garden is the just the beginning of this trip…wait until you get to the thrilling hikes and falls of this journey. You will be making all sorts of memories with the garden’s birds, butterflies, snakes, frogs, monkeys, hummingbirds, and jungle cats. 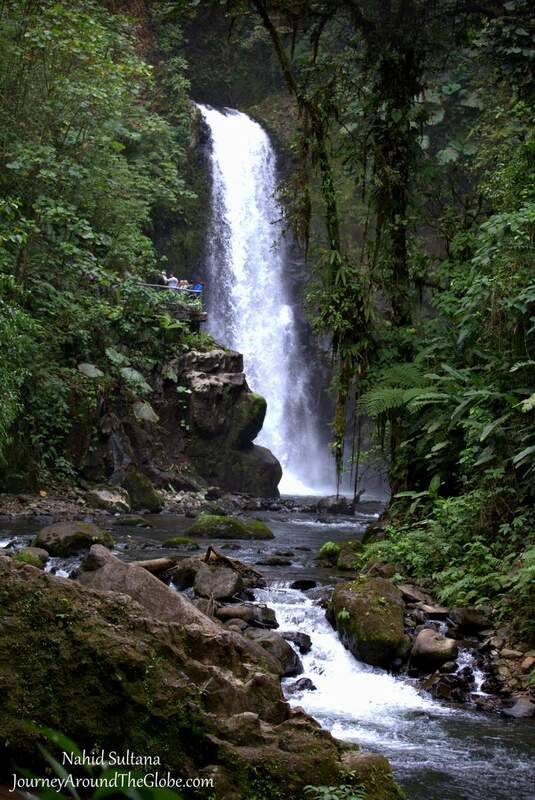 La Paz Waterfalls Garden is a privately owned and managed ecological attraction that opened in the 2000. The construction of the hiking trails and butterfly observatory began in 1998. The park comprises 70 acres or 28 hectares of land. Amazing part of this garden is that the 2.2 miles (3.5 km) of hiking trails and viewing platforms were built without cutting one tree or vine system. Also, the materials for the trails and platforms were carried own on foot in order to avoid the use of heavy equipment in the forest. 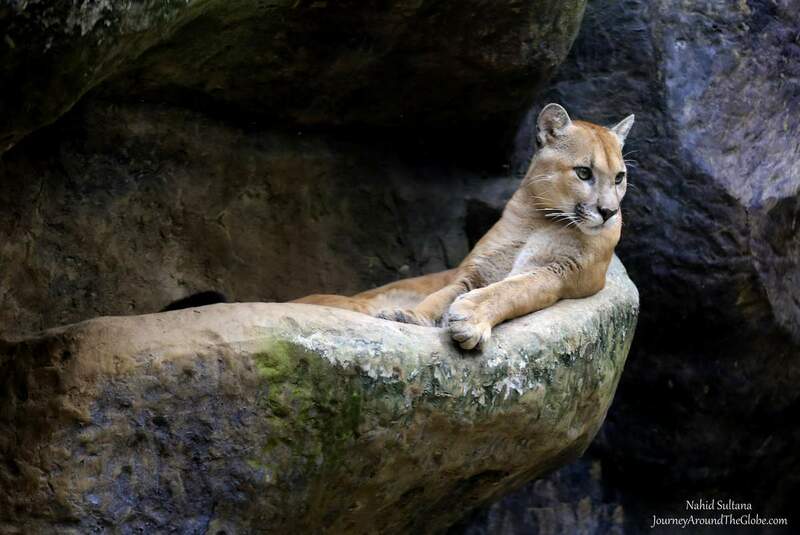 None of the animals in this Wildlife Refuge have been taken from their natural habitat. Most of them were illegally held as pets when the Wild Life Ministry found and confiscated them. Peace Lodge of La Paz Waterfalls Garden is an award winning ultra-upscale accommodation in the symphony of purely Costa Rican rainforest jungle. Guests are so close to the nature here yet in the comfort and luxury of modern rooms and services. There were five waterfalls that we came across during our 3.5 km of long hike in the garden: Magia Blanca (120 feet or 37 meters), Encantada (65 feet or 20 meters), Escondida (10 feet or 3 meters), and La Paz. For its unique landscape and location, this is a gem and an awe-inspiring destination in Costa Rica. Thanks for stopping by! And great site! What a beautiful visit. Nature lovers have to escape the cities to enjoy the beauty of the area. That huge volcano crater really caught my eye as well as the sparkling waterfall. I wish I could see that volcano as a whole…only saw partial of it, and it was something I’ve never seen before.